Home Arsenal Manchester United- Are they the new Arsenal? Business magazine Forbes released this year’s list of the richest football clubs in the world with Manchester United sitting comfortably in third place. United valued at £2.3bn are behind only Barcelona and Real Madrid. The top four clubs are way ahead of the rest with the top 3 valued almost a billion more than fifth placed Arsenal. While they are doing so well financially and commercially, Manchester United are nowhere as good on the football pitch. This season in the Premier League, Manchester United have scored the same number of goals as Sunderland have. On the pitch, they are not even close to the level at which Real Madrid, Barcelona and Bayern Munich play. But off the pitch, there are no signs of slowing down, with next year’s TV deal kicking in, they might even close the gap to Real and Barcelona. United’s seemingly unstoppable commercial success is of course because of their continued on-field success during the Ferguson era. What worked in their favour was that the English Premier League’s popularity spread like wildfire during the 90s and 00s across the globe. And naturally as the most successful side and with some of the most popular stars, they became the most popular football club across the world. This popularity won’t wane anytime soon even with bad results on the pitch. The sheer number of Manchester United fans across Asia and Africa will simply ensure that the numbers never dwindle no matter what happens on the pitch. So the commercial juggernaut that Manchester United is in its present form is in no danger of slowing down irrespective of the results on the pitch. Arsenal’s owners have a simple agenda, “Make Money”. So it doesn’t make any sense for them to spend money in a market inflated by clubs like Chelsea and Manchester City just to compete for trophies, when Wenger is able to ensure a top 4 finish with his limited transfer budget. For a businessman spending $250 million in a transfer window on players who can’t guarantee you even the league title forget the Champions League doesn’t make any sense. Financially, the return on investment is simply very poor. So someone like Arsene Wenger is the perfect manager any businessman would want to have at his club. It’s been eleven years since the Glazers took over and Manchester United have spent more money reducing their debt than on player transfers. Till Sir Alex Ferguson retired, United hardly spent any money on transfers compared to the likes of Real Madrid, Barcelona, Chelsea and Manchester City. So eventually when Ferguson retired,it was obvious that the United squad needed massive overhauling. But the first summer transfer window under Moyes was a disaster with only Marouane Fellaini coming in. As the results on the pitch made it clear that the team needed massive investment, it was only then that the Glazers authorised Ed Woodward(An investment banker who doesn’t understand football) to spend big money. In came a host of players including Angel Di Maria and Radamel Falcao(On Loan). One left disgruntled a year later and the other was well past his weak. United under Van Gaal finished fourth in 2014-15 but the quality of football being played was utterly boring and not in sync with the club’s attacking traditions. Real Madrid, Barcelona, Chelsea, Manchester City, Bayern Munich and Juventus all would have sacked their manager right away if they finished fourth in the league and didn’t do anything of note in the cup runs. United’s football all year(except for when they beat Spurs, Liverpool and City in a run) was dire and there was no sign of progress. But Van Gaal and United managed to convince everyone that the season was a success as they were in “transition”. It was clear that the 2014 summer transfer window had done little to address United’s imbalanced squad. United needed a centerback to partner Smalling, replacement for Michael Carrick and of course a striker. Having sold Angel Di Maria to PSG, United had bought Depay, Schweinsteiger and Schneiderlin till the last day with the total net spend in negative. Then they took a gamble on Anthony Martial on the last day which worked brilliantly for them. But the football remained bad and even though teams like City,Chelsea and Liverpool have struggled in the league,United still find themselves in fifth position with minimal hopes of qualifying for the Champions League next season. United were knocked out of the easiest Champions League group and have hit new lows this season in the Premier League. But still there was no intent of sacking Van Gaal. 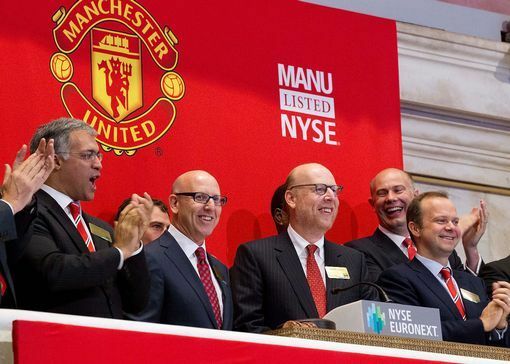 The Glazers and Woodward won’t mind boring football,lack of trophies or bad transfers until the money keeps flowing. Van Gaal got them Champions League football the first time around and so they trusted him to do the same again. And they will only act if United miss out on the Champions League this season. And this might be the future of Manchester United Football Club where the owners’ intent is to keep United playing at the highest level(Which is playing in Champions League) by spending the least amount of money. There is no use finding fault with Ed Woodward’s decisions either, after all he is not answerable for the quality of football being played or the number of trophies won, he is answerable for Manchester United’s balance sheet. Ferguson supported the Glazers takeover, there was something definitely fishy there.